"It's a pretty good zoo," said young Gerald McGrew, "and the fellow who runs it seems proud of it, too." 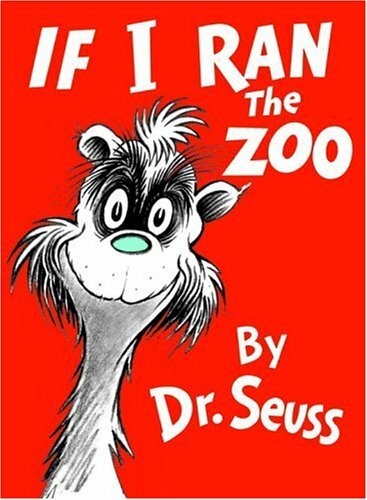 But if Gerald ran the zoo, the New Zoo, McGrew Zoo, he'd see to making a change or two: "So I'd open each cage. I'd unlock every pen, let the animals go, and start over again." And that's just what Gerald imagines, as he travels the world in this playfully illustrated Dr. Seuss classic (first published back in 1950), collecting all sorts of beasts "that you don't see every day." From the mountains of Zomba-ma-Tant to the blistering sands of the Desert of Zind, Gerald hunts down every animal imaginable ("I'll catch 'em in countries no one can spell, like the country of Motta-fa-Potta-fa-Pell"). Whether it's a scraggle-foot Mulligatawny or a wild-haired Iota (from "the far western part of south-east North Dakota"), Gerald amazes the world with his new and improved zoo: "This Zoo Keeper, New Keeper's simply astounding! He travels so far that you think he would drop! When do you suppose this young fellow will stop?"